BOL Wood Service has been using NuMark Markers for over 12 years.. One marker can scale up to 20 to 25 th feet of wood. Neither rain nor snow can stop these. 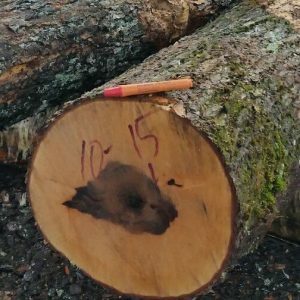 The marker stays on the logs until they are processed. It would take 5 cans of spray paint or more to do the job that 1 of the markers can do. I was the shipping and receiving manager and I used the marker to write on boxes that were to be shipped out. I’ve had this marker for 35+ years and it still works like new. I don’t use it as much as I did when working but I know that when I need to write on something I can always count on this favorite marker of mine. I want to thank you for making a marker that is second to none. There are no/zero markers past or present that even comes close to the quality and dependability of the Nu-Mark. What your company does: Fabricate nuclear components for the Navy. I carried and used the metal case nu-marker ever day at my work place for at lest 10 years if not more. 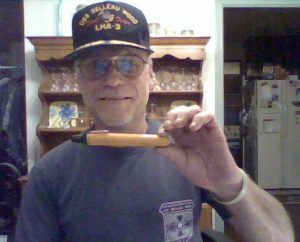 I retired 1998 and and still using your marker today 2018. How long will they last???? How long you have been using our Markers: 30 years ??? From the NuMark crew: Thank you for sharing your story! Tell us your story. We are proud of our markers and want to share your application and success stories. Your feedback will help others understand the value of our products and it’s a great way to network! Submit a photo of what you use our Nu-Mark Markers for. By clicking SEND you agree to allow NuMark Marker Co., LLC to use your submit information, in whole or part, on our web site and social media.